Professional Training Year at Cardiff University: Bag and Remove in Cymru (BARC). I am currently studying for my BSc Biology degree and am on a professional training year working within CRIPES. Parasites, their effects on the environment and intricate life cycles have always fascinated me, so I jumped at the opportunity to work with Prof Jo Cable on the BARC project (Bag And Remove in Cymru) within CRIPES. This has been a valuable experience as it has allowed me to improve my skills in lab management whilst furthering my knowledge of host-parasite systems. Toxocariasis is a condition caused by ingestion of eggs from the nematode canid and felid parasites Toxocara canis and T. cati. Relatively low levels of Toxocariasis have been reported in the UK, however the condition can often go undiagnosed and so may be more common than previously thought. The aim of BARC is to investigate the prevalence of Toxocara spp. eggs in soil from gardens and parks throughout the UK. By achieving an idea of prevalence we can assess the risk to humans posed by Toxocara spp. and implement effective control strategies, such as anti-dog fouling campaigns. 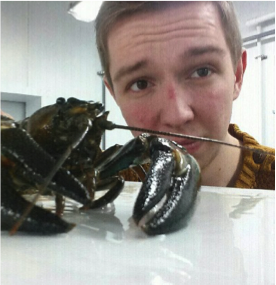 Professional Training Year at Cardiff University: Investigating the impact of Branchiobdellid infection on the interspecific interactions of Signal and Virile Crayfish. Currently a third year studying for a zoology degree at Cardiff University, I decided to dedicate a year of my degree undergoing a placement within CRIPES. This has provided me with the perfect opportunity to not only gain much vital research experience, but also to deepen my knowledge in a field of particular interest to me – parasitology. Specifically, I am looking at the relationship between two alien crayfish species, virile and signal crayfish (Orconectes virilis and Pacifastacus leniusculus respectively) and their ectosymbiotic branchiobdellids (Xironogiton victoriensis). These annelid worms are poorly understood, and have been variously described as diatom feeders, blood feeders or as parasites in the adult stage, but are currently considered ectosymbionts. I hope to shed a little light on this relationship, by determining whether these worms are capable of behavioural modification of host crayfish. I will achieve this by assessing whether branchiobdellid infection influences any aspect of the interspecific interactions between virile and signal crayfish. Professional Training Year at Cardiff University: ecology of parasites and invasive species. I am an ecology undergraduate in the School of Biosciences, Cardiff University, and also the president of the Cardiff Wildlife and Conservation Society. During my university career I have been involved in the Storm Petrels Project in Portugal, have worked in ecological consultancy in fresh water ecosystems, and been involved in conservation projects in the Danau Girang Field Centre in Borneo. I have had a long term interest in disease ecology and parasitology, and hope to pursue a career in conservation biology. For my Professional Training Year (PTY 2014-2015), I am working with the CRIPES crayfish team to better understand the ecology of invasive species particularly with regard to nitrate tolerance. During the course of this year I will be conducting a number of experiments studying the effects of nitrate on the behaviour of two invasive crayfish species, performing crayfish dissections as part of an existing experiment into crayfish plague prevalence in the UK. I will also be learning about the genetic analysis of Gyrodactylus parasites. By increasing my lab and field work skills, I hope to gain sufficient research experience that will help me find a PhD position after graduation, ultimately leading to a career in academia. Professional Training Year: Interactions between gut microbiota and macroparasites. I am an undergrad student studying for a Biology degree at Cardiff University. I am currently undertaking a professional training year with CRIPES and the ECOBIOME group at Foundazione Edmund Mach in Italy. The ECOBIOME group aim to understand how the bacteria in the gut, the microbiota, interact with parasitic helminths within the host. Within this larger study my research is focused on the parasitic helminth Heligmosomoides polygyrus. I am investigating interactions between the fecundity of H. polygyrus in relation to the faecal microbiota of the host, the wild yellow necked mouse, Apodemus flavicollis. This exciting branch of research is expected to shed light on hitherto poorly understood mechanisms and possibly new interactions. Professional Training Year: Professional Training Year at Cardiff University: Bag and Remove in Cymru (BARC). I am currently on a Professional Training Year (PTY 2014-2015) working with CRIPES while studying towards by BSc Biology degree, intending to pursue a career in epidemiology/parasitology. Initially I was involved with the primatology component of the MONKEYBAR project, entitled “Defining the biomedical, environmental and social risk factors for human infection with Plasmodium knowlesi; opportunities for prevention and control of an emerging zoonotic infection”, headed by the London School of Hygiene & Tropical Medicine. I then went on to design one of the first investigations into nocturnal mosquito diversity with the ultimate aim of assessing the prevalence of Plasmodium spp., under the supervision of Dr Milena Salgado-Lynn, at the Danau Girang Field Centre in Borneo, where I was engaged in hands on conservation projects for ca. 3 months. I am now working with the BARC project under the supervision of Prof Jo Cable investigating the prevalence of Toxocara spp. eggs in soil from gardens, parks, footpaths and dog homes throughout the UK. This study will open up avenues for increasing the effectiveness of control strategies aimed at reducing dog fouling and associated parasites. Below is a list of the projects that some of the Biology/Ecology/Zoology final year undergraduate students have carried out within CRIPES.